If you are sick of sugary cereal for breakfast, try this hearty Chorizo and Egg Scramble this weekend while you enjoy the Sunday paper. The spicy and smoky flavors of chorizo are the perfect addition to light and fluffy scrambled eggs, and onion, garlic, and cheese make this breakfast dish an entire meal. Serve it for a Mexican-inspired brunch, or whip up a batch for yourself and enjoy it with a steaming cup of coffee. This breakfast dish is surprisingly easy and flexible so you’ll be enjoying Chorizo and Eggs in just minutes! In large skillet heat oil. Add chorizo and brown, 1-2 minutes. Add garlic and onion and sautee until aromatic and soft. In medium bowl combine eggs and salt. Beat until frothy. Add eggs to chorizo and stir constantly until eggs begin to set but are still moist. Remove from heat. Serve immediately with warmed flour tortillas. Garnish with cheese and cilantro. 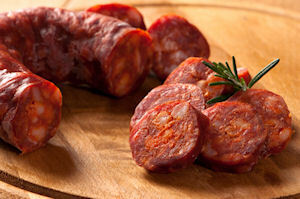 Back to the Chorizo Recipes home page. I added a spoonful of sour cream, then took it and poured it over mini cheese ravioli and sprinkled Parmesan over the top... YUM. As Joe commented you do not need the oil. I have made similar recipes to this and I actually drain the grease from the chorizo before adding the eggs. You don't really need oil to fry the ingredients because the sausage releases alot of grease. Jalapeños are very good in this. Summary: If you are sick of sugary cereal for breakfast, try this hearty Chorizo and Egg Scramble this weekend while you enjoy the Sunday paper. The spicy and smoky flavors of chorizo are the perfect addition to light and fluffy scrambled eggs, and onion, garlic, and cheese make this breakfast dish an entire meal. Serve it for a Mexican-inspired brunch, or whip up a batch for yourself and enjoy it with a steaming cup of coffee. This breakfast dish is surprisingly easy and flexible so you’ll be enjoying Chorizo and Eggs in just minutes!